Cookbooks may be general, or may specialize in a particular cuisine or category of food. Recipes in cookbooks are organized in various ways: by course (appetizer, first course, main course, dessert), by main ingredient, by cooking technique, alphabetically, by region or country, and so on. They may include illustrations of finished dishes and preparation steps; discussions of cooking techniques, advice on kitchen equipment, ingredients, and substitutions; historical and cultural notes; and so on. Cookbooks may be written by individual authors, who may be chefs, cooking teachers, or other food writers; they may be written by collectives; or they may be anonymous. They may be addressed to home cooks, to professional restaurant cooks, to institutional cooks, or to more specialized audiences. Some cookbooks are didactic, with detailed recipes addressed to beginners or people learning to cook particular dishes or cuisines; others are simple aide-memoires, which may document the composition of a dish or even precise measurements, but not detailed techniques. Apicius, De re coquinaria, an early collection of Roman recipes. Ancient Mesopotamian recipes have been found on three Akkadian tablets, dating to about 1700 BC. An abbreviated epitome entitled Apici Excerpta a Vinidario, a "pocket Apicius" by Vinidarius, "an illustrious man", was made in the Carolingian era. In spite of its late date it represents the last manifestation of the cuisine of Antiquity. The earliest cookbooks known in Arabic are those of al-Warraq (an early 10th-century compendium of recipes from the 9th and 10th centuries) and al-Baghdadi (13th century). Manasollasa from India contains recipes of vegetarian and non-vegetarian cuisines, which preceded the cookbook writing history in Europe by a century. While the text is not the first among Indian books to describe fermented foods, it contains a range of cuisines based on fermentation of cereals and flours. Chinese recipe books are known from the Tang dynasty, but most were lost. One of the earliest surviving Chinese-language cookbooks is Hu Sihui's "Yinshan Zhengyao" (Important Principles of Food and Drink), believed to be from 1330. Hu Sihui, Buyantu Khan's dietitian and therapist, recorded a Chinese-inflected Central Asian cuisine as eaten by the Yuan court; his recipes were adapted from foods eaten all over the Mongol Empire. Eumsik dimibang, written around 1670, is the oldest Korean cookbook and the first cookbook written by a woman in East Asia. Low and High German manuscripts are among the most numerous. Among them is Daz buch von guter spise ("The Book of Good Food") written c. 1350 in Würzberg and Kuchenmeysterey ("Kitchen Mastery"), the first printed German cookbook from 1485. Two French collections are probably the most famous: Le Viandier ("The Provisioner") was compiled in the late 14th century by Guillaume Tirel, master chef for two French kings; and Le Menagier de Paris ("The Householder of Paris"), a household book written by an anonymous middle class Parisian in the 1390s. Du fait de cuisine is another Medieval French cookbook, written in 1420. From Southern Europe there is the 14th century Valencian manuscript Llibre de Sent Soví (1324), the Catalan Llibre de totes maneres de potatges de menjar ("The book of all recipes of dishes") and several Italian collections, notably the Venetian mid-14th century Libro per Cuoco, with its 135 recipes alphabetically arranged. The printed De honesta voluptate et valetudine ("On honourable pleasure"), first published in 1475, is one of the first cookbooks based on Renaissance ideals, and, though it is as much a series of moral essays as a cookbook, has been described as "the anthology that closed the book on medieval Italian cooking". Medieval English cookbooks include The Forme of Cury and Utilis Coquinario, both written in the fourteenth century. The Forme of Cury is a cookbook authored by the chefs of Richard II. Utilis Coquinario is a similar cookbook though written by an unknown author. Recipes originating in England also include the earliest recorded recipe for ravioli (1390s). With the advent of the printing press in the 16th and 17th centuries, numerous books were written on how to manage households and prepare food. In Holland and England competition grew between the noble families as to who could prepare the most lavish banquet. By the 1660s, cookery had progressed to an art form and good cooks were in demand. Many of them published their own books detailing their recipes in competition with their rivals. Many of these books have now been translated and are available online. By the 19th century, the Victorian preoccupation for domestic respectability brought about the emergence of cookery writing in its modern form. In 1796, the first known American cookbook titled, American Cookery, written by Amelia Simmons, was published in Hartford, Connecticut. Until then, the cookbooks printed and used in the Thirteen Colonies were British. The first modern cookery writer and compiler of recipes for the home was Eliza Acton. Her pioneering cookbook, Modern Cookery for Private Families (1845), was aimed at the domestic reader rather than the professional cook or chef. This was an immensely influential book, and it established the format for modern writing about cookery. 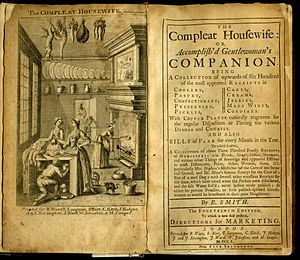 The publication introduced the now-universal practice of listing the ingredients and suggested cooking times with each recipe. It included the first recipe for Brussels sprouts. Contemporary chef Delia Smith is quoted as having called Acton "the best writer of recipes in the English language." Modern Cookery long survived her, remaining in print until 1914 and available more recently in facsimile reprint. Acton's work was an important influence on Isabella Beeton, who published Mrs Beeton's Book of Household Management in 24 monthly parts between 1857 and 1861. The book was a guide to running a Victorian household, with advice on fashion, child care, animal husbandry, poisons, the management of servants, science, religion, and industrialism. Despite its title, most of the text consisted of recipes, such that another popular name for the volume is Mrs Beeton's Cookbook. Most of the recipes were illustrated with coloured engravings, and it was the first book to show recipes in a format that is still used today. Many of the recipes were plagiarised from earlier writers, including Acton. In 1885 the Virginia Cookery Book was published by Mary Stuart Smith. In 1896 the American cook Fannie Farmer (1857–1915) published The Boston Cooking School Cookbook which contained some 1,849 recipes. Cookbooks that serve as basic kitchen references (sometimes known as "kitchen bibles") began to appear in the early modern period. They provided not just recipes but overall instruction for both kitchen technique and household management. Such books were written primarily for housewives and occasionally domestic servants as opposed to professional cooks, and at times books such as The Joy of Cooking (USA), La bonne cuisine de Madame E. Saint-Ange (France), The Art of Cookery (UK, USA), Il cucchiaio d'argento (Italy), and A Gift to Young Housewives (Russia) have served as references of record for national cuisines. Cookbook also tell stories of the writers themselves and reflect upon the era in which they are written. They often reveal notions of social, political, environmental or economic contexts. For example, during the era of industrialization, convenience foods were brought into many households and were integrated and present in cookbooks written in this time. Related to this class are instructional cookbooks, which combine recipes with in-depth, step-by-step recipes to teach beginning cooks basic concepts and techniques. In vernacular literature, people may collect traditional recipes in family cookbooks. While western cookbooks usually group recipes for main courses by the main ingredient of the dishes, Japanese cookbooks usually group them by cooking techniques (e.g., fried foods, steamed foods, and grilled foods). Both styles of cookbook have additional recipe groupings such as soups or sweets. International and ethnic cookbooks fall into two categories: the kitchen references of other cultures, translated into other languages; and books translating the recipes of another culture into the languages, techniques, and ingredients of a new audience. The latter style often doubles as a sort of culinary travelogue, giving background and context to a recipe that the first type of book would assume its audience is already familiar with. Popular Puerto Rican cookbook, Cocina Criolla, written by Carmen Aboy Valldejuli, includes recipes that are typically of traditional Puerto Rican cuisine such as mofongo and pasteles. Valldejuli’s cookbook was not only important to Puerto Ricans, but also very popular in the United States where her original cookbook has since been published in several editions, including English versions. These include The Art of Caribbean Cookery - Doubleday, 1957; Puerto Rican Cookery - Pelican Publishing, 1983; and, Juntos en la Cocina (co-authored with her husband, Luis F. Valldejuli) - Pelican Publishing, 1986. Professional cookbooks are designed for the use of working chefs and culinary students and sometimes double as textbooks for culinary schools. Such books deal not only in recipes and techniques, but often service and kitchen workflow matters. Many such books deal in substantially larger quantities than home cookbooks, such as making sauces by the liter or preparing dishes for large numbers of people in a catering setting. While the most famous of such books today are books like Le guide culinaire by Escoffier or The Professional Chef by the Culinary Institute of America, such books go at least back to medieval times, represented then by works such as Taillevent's Viandier and Chiquart d'Amiço's Du fait de cuisine. Single-subject books, usually dealing with a specific ingredient, technique, class of dishes or target group (e.g. for kids), are quite common as well. Jack Monroe for example features low budget recipes. Some imprints such as Chronicle Books have specialized in this sort of book, with books on dishes like curries, pizza, and simplified ethnic food. Popular subjects for narrow-subject books on technique include grilling/barbecue, baking, outdoor cooking, and even recipe cloning (Recipe cloning is copying commercial recipes where the original is a trade secret). Community cookbooks (also known as compiled, regional, charitable, and fund-raising cookbooks) are a unique genre of culinary literature. Community cookbooks focus on home cooking, often documenting regional, ethnic, family, and societal traditions, as well as local history. Sondra Gotlieb, for example, wrote her cookbooks on Canadian food culture by visiting people and homes by region. She gathered recipes, observed the foodways, observed the people and their traditions of each region by being in their own homes. Gotlieb did this so that she could put together a comprehensive cookbook based on the communities and individuals that make up Canada.Gooseberry Patch has been publishing community-style cookbooks since 1992 and built their brand on this community. Cookbooks can also document the food of a specific chef (particularly in conjunction with a cooking show) or restaurant. Many of these books, particularly those written by or for a well-established cook with a long-running TV show or popular restaurant, become part of extended series of books that can be released over the course of many years. Popular chef-authors throughout history include people such as Delia Smith, Julia Child, James Beard, Nigella Lawson, Edouard de Pomiane, Jeff Smith, Emeril Lagasse, Claudia Roden, Madhur Jaffrey, Katsuyo Kobayashi, and possibly even Apicius, the semi-pseudonymous author of the Roman cookbook De re coquinaria, who shared a name with at least one other famous food figure of the ancient world. Arte de Cocina, Pastelaria, Vizcocheria e Conservaria by Francisco Martinez Montiño - palace cook of King Philip II of Spain (1680). Several libraries have extensive collections of cookbooks. Harvard's Schlesinger Library on the History of Women in America has a collection of 20,000 cookbooks and other books on food, including the earliest American cookbook, and the personal collections and papers of Julia Child, M.F.K. Fisher, and the authors of The Joy of Cooking. New York University's Fales Library includes a Food and Cookery Collection of over 15,000 books, including the personal libraries of James Beard, Cecily Brownstone, and Dalia Carmel. The Brotherton Library at University of Leeds holds a Designated Cookery Collection of over 8,000 books and 75 manuscripts, including the personal collections of Blanche Leigh, John Preston and Michael Bateman. Some individuals are notable for their collections of cookbooks, or their scholarly interest therein. Elizabeth Robins Pennell, an American critic in London from the 1880s, was an early writer on the subject, and has recently been called "one of the most well-known cookbook collectors in the world". Much of her collection eventually went to the Rare Book and Special Collections Division at the Library of Congress. Held alongside hers are the thousands of gastronomic volumes donated by food chemist Katherine Bitting; their collections were evaluated in tandem in Two Loaf-Givers, by one of the LOC's curators; a digital version is available. The term cookbook is sometimes used metaphorically to refer to any book containing a straightforward set of already tried and tested "recipes" or instructions for a specific field or activity, presented in detail so that the users who are not necessarily expert in the field can produce workable results. Examples include a set of circuit designs in electronics, a book of magic spells, or The Anarchist Cookbook, a set of instructions on destruction and living outside the law. O'Reilly Media publishes a series of books about computer programming named the Cookbook series, and each of these books contain hundreds of ready to use, cut and paste examples to solve a specific problem in a single programming language. ^ Yale University (June 13, 2018). "Interdisciplinary team cooks 4000-year old Babylonian stews at NYU event". YouTube. Retrieved June 29, 2018. ^ Adamson, Melitta Weiss. "The Greco-Roman World" in Regional Cuisines of Medieval Europe, p. 6–7; Simon Varey, "Medieval and Renaissance Italy, A. The Peninsula" in Regional Cuisines of Medieval Europe, pp. 85–86. ^ About Vinidarius himself nothing is known; he may have been a Goth, in which case his Gothic name may have been Vinithaharjis. ^ Snodgrass 2004, p. 452. ^ K.T. Achaya (2003). The Story of Our Food. Orient Blackswan. p. 85. ISBN 978-81-7371-293-7. ^ Jyoti Prakash Tamang; Kasipathy Kailasapathy (2010). Fermented Foods and Beverages of the World. CRC Press. p. 16. ISBN 978-1-4200-9496-1. ^ Hu Sihui, Paul D. Buell, Eugene N. Anderson, tr., A Soup for the Qan: Chinese Dietary Medicine of the Mongol Era as Seen in Hu Szu-Hui's Yin-Shan Cheng-Yao: Introduction, Translation, Commentary and Chinese Text (London; New York: Kegan Paul International, 2000. ISBN 0710305834), p. 1-8. ^ John Dickie, Delizia! The Epic History of the Italians and Their Food 2008, pp50f. ^ Constance B. Hieatt, "Sorting Through the Titles of Medieval Dishes: What Is, or Is Not, a 'Blanc Manger'" in Food in the Middle Ages, pp. 32–33. ^ Adamson (2004), pp. 103, 107. ^ Text printed in E. Faccioli, ed. Arte della cucina dal XIV al XIX secolo (Milan, 1966) vol. I, pp.61-105, analysed by John Dickie 2008, pp 50ff. ^ Simon Varey, "Medieval and Renaissance Italy, A. The Peninsula" in Regional Cuisines of Medieval Europe, p. 92. ^ May, Robert (1685). The accompliſht Cook. ^ Judy Gerjuoy. "Medieval Cookbooks". Retrieved 2007-06-15. ^ "Food in season in April 1861". Archived from the original on 2013-11-19. Retrieved 2014-06-02. ^ Smith, Mary Stuart (1885). Virginia Cookery Book. New York: Harper and Bros.
^ Bowers, Anne (1997). Recipes for Reading: Community Cookbooks, Stories, Histories. Amherst: University of Massachusetts Press. ISBN 978-1-55849-089-5. ^ Keneally, Rhona Richman. There is a Canadian Cuisine, and it is unique in all the world: Crafting National Food Culture during the Long 1960s. ^ "Cookery Collections Guide". Special Collections. Leeds University Library. Retrieved 19 April 2017. ^ White, Eileen (2004). The English Cookery Book: Historical Essays (PDF). Prospect Books. pp. 6–27. ISBN 1 90301836 6. Retrieved 19 April 2017. ^ "A Greedy Woman:The Long, Delicious Shelf Life of Elizabeth Robins Pennell". Cynthia D. Bertelsen. August 2009. Fine Books Magazine. ^ "From the Rare Book and Special Collections Division". loc.gov. What's the Recipe? - Our hunger for cookbooks., Adam Gopnik, The New Yorker, 2009.